Randall Takenaka was wanting to catch something pretty badly after a weekend of fruitless fishing, so the following weekend he joined some friends at a new location and got more than he'd expected. Randalls IRW pole slammed down and his Penn 4/0 reel gave up 80-lb test Trilene line like it had hooked a speed boat. 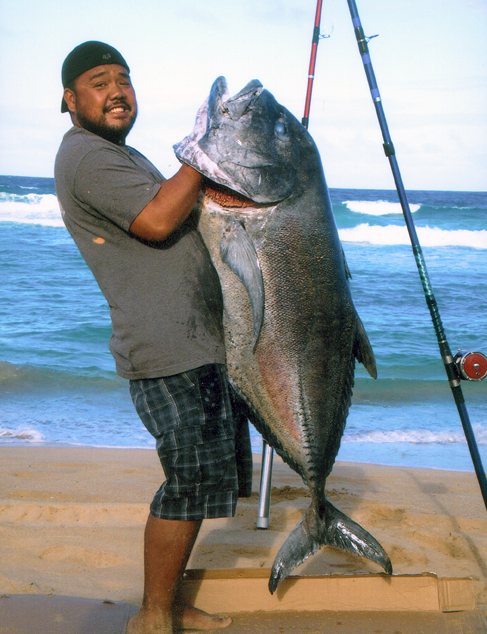 After a hard-fought battle, Cale Fernandez gaffed Randall's 102-lb ulua and the "Happy Dance" began!